By Noor Nizam – Peace and Political Activist & Political Communication Researcher (Canada.) 17.12.2015. The above news item which appeared in the Adaderana.lk news 18th., December with the above photograph was indeed something important in the context of Canada – Sri Lanka diplomatic and friendly relations. This news item may be expressing Canada’s solidarity towards Sri Lanka in making the North of Sri Lanka finally free of landmines, but the pioneers of this programme, though they are patriots living in Canada, 3 or 4 members of SLUNA and the especially the writer of this article, pioneered the engagement of Canada in initiating the assistance for landmine clearing in the North, by creating a dialogue and briefing the Canadian political authorities and the then Deputy Minister of Foreign Affairs and International relations – Hon. Deepak Obhrai of the former Hon. Stephen Haper government in August 2009. The International Community had given a deadline of 180 days to Sri Lanka to clear the landmines in the Northern and Wanni district to resettle the Sri Lankan Tamils who were living in temporary camps in Manik Farm and other sites in the Wanni/Mannar areas, which GENEVA claimed as a violation of Human Rights. A one to one meeting held at the Canadian Immigration and Citizenship office in Toronto with Hon. Deepak Obhrai, his officials and a Sri Lanka-Canadian citizen’s delegation comprising of Mahinda, Gunesekera, Lawyer Hasaka Ratnamalala, Lenin Benedict and the writer (Noor Nizam) the same month stressed the need for landmine clearing machinery and equipment to Sri Lanka if the 180 day deadline was to be met. At this meeting a strong LTTE representative group of the Tamil diaspora comprising of around 8 members, some being lawyers were present to counter our request. We were not informed of their participation at this meeting until they arrived at the meeting table on that day. Presenting our case with formidable reasons, we were able to counter all the allegations of the LTTE representative group and convince Hon. Deepak Obhrai to make a statement that he was going to advice the government appropriate measures to support landmine clearing in the North of Sri Lanka. At one stage of the discussion, the Hon. Deepak Obhrai reprimanded the LTTE front group not to tell lies and distort facts, because he said that he had visited Sri Lanka along with the Parliamentary Secretary to Minister for Foreign Affairs Lawrence Canon, from July 5 to July 7 2009 and seen for himself the truth in the North and East. Thus the Patriotic” Sri Lankan-Canadian citizens were able to render a yeoman service to Sri Lankan as a whole and especially the Tamils of the North to expedite the clearing of landmines in the North and Wanni districts. Within 4 – 5days of this discussion, Hon. Basil Rajapaksa got a call from the then Canadian High Commissioner in Colombo informing the support from Canada for landmine clearing in the North with immediate effect. They offered assistance to airlift 5 land clearing machines promptly. 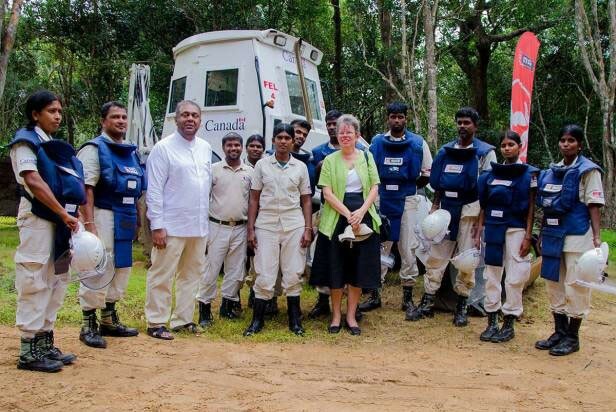 Thus commenced this landmine clearing support from Canada to Sri Lanka. Sorry to state, NO politicians or diplomats were involved in this endeavor. These are some of the untold stories of the dedicated work that were done by Patriotic Sri Lankan-Canadian citizens during the difficult times that Sri Lanka went through fighting the war, winning and resettling the IDP’s in the North and East. This entry was posted on Thursday, December 17th, 2015. You can follow any responses to this entry through the RSS 2.0 feed. You can skip to the end and leave a response.